Three space station fliers -- the outgoing NASA commander and two Russian cosmonauts -- undocked and returned to Earth Wednesday, ending a 167-day stay in space with a nail-biting communications blackout that left the crew out of contact with Russian flight controllers during much of the trip home. The cause of the communications dropout was not immediately known, but during a brief exchange with recovery crews during the final stages of the descent, spacecraft commander Alexander Samokutyaev reported all three crew members were in good shape and proceeding to an on-target touchdown on the snowy steppe of Kazakhstan. Landing was expected around 10:08 p.m., but low clouds and icy fog blocked a clear view of the touchdown and it took another nine minutes or so before Russian recovery crews confirmed the descent module was on the ground and in a vertical orientation. An exact landing time was not immediately known. As always with Soyuz landings, Russian recovery forces and a team of U.S. and Russian flight surgeons were standing by near the landing zone to help the returning station fliers -- Samokutyaev, flight engineer Elena Serova and Barry "Butch" Wilmore -- out of the cramped descent module for initial medical checks and satellite calls home to friends and family. 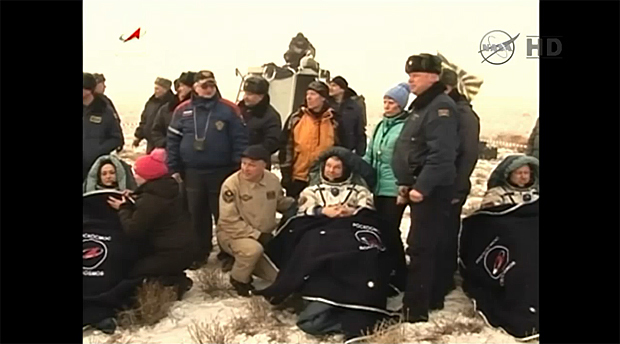 Carried to recliners near the descent module and quickly bundled in blankets, all three crew members appeared healthy and in good spirits, smiling and chatting with recovery crews before they were hustled away to a nearby medical tent for more extensive checks. Before leaving the space station, Wilmore said he looked forward to re-entry aboard the Soyuz. "It's not many jobs that you have the opportunity to return from work in a 17,000-mile-an-hour fireball," Wilmore, a fighter pilot with a shuttle mission to his credit, joked a few days ago. "This is one of those opportunities! To be honest, I'm not a thrill seeker by any means, but a unique experience like that, I do look forward to it, literally coming back in a fireball." At touchdown, Samokutyaev had logged a combined 331 days in space during two space flights. Wilmore's total, including one shuttle flight, stood at 178 days while Serova, completing her first mission, had logged 167 days aloft. All three planned to fly by helicopter to Karaganda before splitting up for separate trips home. Wilmore will board a NASA jet and fly back to Houston while Samokutyaev and Serova will head for home in Star City near Moscow for debriefing. Left behind aboard the space station were Expedition 43 commander Terry Virts, cosmonaut Anton Shkaplerov and European Space Agency astronaut Samantha Cristoforetti. During a change-of-command ceremony Tuesday, Wilmore thanked his crewmates for a successful stay in space. "I can't say enough about our crew on board," he said. "What a blessing to have this group of people assembled together. The joy, the fun that we've had together, the work that we've done together has just truly been amazing." Virts thanked Wilmore for "the amazing job you've done as commander." "You have been a perfect example for us, you're exactly what a space station commander should be, and it's been a real blessing to have you," he said. Virts and his crewmates will have the lab to themselves until March 27 when another Soyuz, TMA-16M, carries veteran cosmonaut Gennady Padalka, Scott Kelly and Mikhail Kornienko to the lab complex. Padalka, who has logged 711 days in space during four previous flights, plans to return to Earth in September, becoming the world's most experienced spaceman in the process and pushing his total time to 877 days. Kelly and Kornienko plan to spend nearly a full year aboard the laboratory, serving as test subjects for a variety of medical experiments to learn more about the long-term effects of the space environment, from prolonged weightlessness to higher levels of radiation. While four cosmonauts flew for a year or longer during the Mir era, Kelly and Kornienko will set a new duration record for the International Space Station while Kelly will set the endurance mark for U.S. astronauts. Asked if he might one day be interested in a year-long flight like Kelly's, Wilmore said he wasn't so sure. "My wife, my family would say go, but I've got a seven year old and a ten year old, and I’ve got to think about them as well," he said. "So, yeah, part of me says I'll go, but there'd be a lot of discussion and a lot of decisions made within my household before I could actually sign up for something like that." The Soyuz TMA-14M return to Earth began with undocking from the lab's Russian Poisk module at 6:44 p.m.
After moving about 12 miles away from the lab complex, Samokutyaev monitored a computer-orchestrated deorbit rocket firing to drop the ship out of orbit. The "burn" was expected to last four minutes and 41 seconds, slowing the ship by about 286 mph, but communications were cut off about 90 seconds after ignition. Twenty-three minutes later, with the crew still out of contact with Russian flight controllers, the three modules making up the Soyuz TMA-14 spacecraft separated as planned and the central descent module, carrying the returning station fliers, oriented itself heat shield first before slamming into the discernible atmosphere about 62 miles above the south Atlantic Ocean. Intermittent communications were restored well after atmospheric entry began and Samokutyaev reported the crew was in good shape a few minutes before touchdown. There as no immediate word on what caused the communications blackout, but whatever it was, it had no apparent effect on the re-entry as the spacecraft made a near bullseye landing. Wilmore's crew helped kick off a busy year aboard the station as NASA carries out a major reconfiguration of the lab complex, installing new docking mechanisms, wiring and antennas needed by commercial crew capsules being built by Boeing and SpaceX. Seven U.S. spacewalks are planned, including three carried out earlier this month by Wilmore and Virts. The crew also accepted delivery of two Russian Progress cargo ships, a SpaceX Dragon supply capsule and carried out dozens of experiments. And along the way, Wilmore, a diehard SEC football fan, enjoyed watching the Tennessee Volunteers in games beamed up from mission control. But Wilmore's top priority was the science. "Much of what we have done, preparing the station for the future, that's a lot about what Expeditions 41 and 42 have been about," he said. "We've done some cutting-edge science, initial rodent research and dealing with zebra fish and various other animals up here, also capillary flow experiments, combustion science, vegetation growth. “And it's all looking to the future, to prepare ourselves to go farther, beyond low-Earth orbit into the far reaches, perhaps one day, of the solar system." 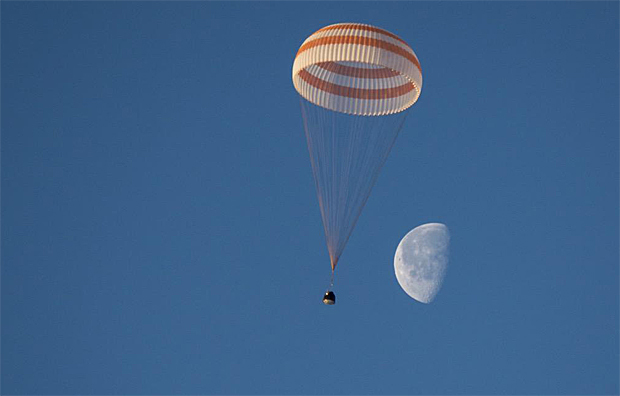 While he looked forward to experiencing landing aboard a Soyuz spacecraft, Wilmore said he was particularly eager to see his family and friends. "That's one of the great things that NASA affords us with IP phone, email and other things that are pretty much real time up here, and it's to share the experience with those we care about and those we love," he said. "And that's been very special. To be able to do that face to face, I'm really looking forward to that."